Leading Manufacturer of laboratory disperser from Mumbai. The laboratory disperser is fitted with a robust air-cooled motor to efficiently perform most dispersing and mixing tasks. The power chain is mounted onto a sturdy aluninium stand, equipped with safety switch and counter-weight, to ensure secured and smooth displacement. 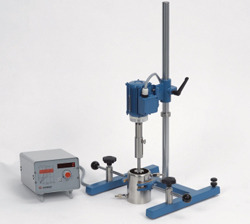 The pid controller constantly maintains the dispersing speed, independent from the sample viscosity.